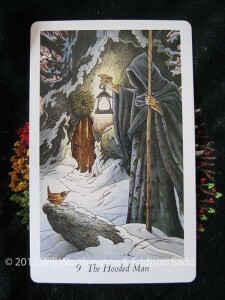 The Hooded Man comes out to join us and reminds us that we have our own character to attend to. Attending to our own character, our own attitudes, energies and thoughts is often a hard one to do, until we’re faced with a situation where we can do nothing else. Whether the thoughts hinder or help us, how we think about a problem is often the solution to the problem, or a part of it. When things go wrong, and they do, do you play over and over in your mind how you would have liked things to go? Do you play that incident on re-play, editing it time and time again? I do this, a lot. I aspire to the Queen of Cups, the lady who has control over her emotions, but usually I act like the Page of Cups. I don’t mean to, but I have discovered this week that I’m human, like everyone else. I’m not sure what galls me the most: the fact that I am human (lol!) or the fact that at my age, the mother of three, I returned to how I acted in my late teens, frustrated in-articulation and all. As us Scots say, I opened my mouth and let my belly rumble, without stopping to collect my own thoughts, especially after my own Oracle post on Sunday! Seems I cannot win, no matter what I try! The truth is, the answer lies within. It always has. The Hooded Man reminds us of that. We can choose how to act, how to speak. We don’t always listen to ourselves because we’re human, but when we recognise the frailties that we each posses manifest, we can either better ourselves or carry on regardless. Personally, I’ll be beating myself up for a few more days yet over what happened, really work on this character thing. Some might say I’m kicking myself, or chewing the fat over this incident. But I’d rather do it to myself than have someone else do it to me: wouldn’t you? In the mean time, the Hooded Man reminds me to listen to the little voice within before I remove the hood and speak. 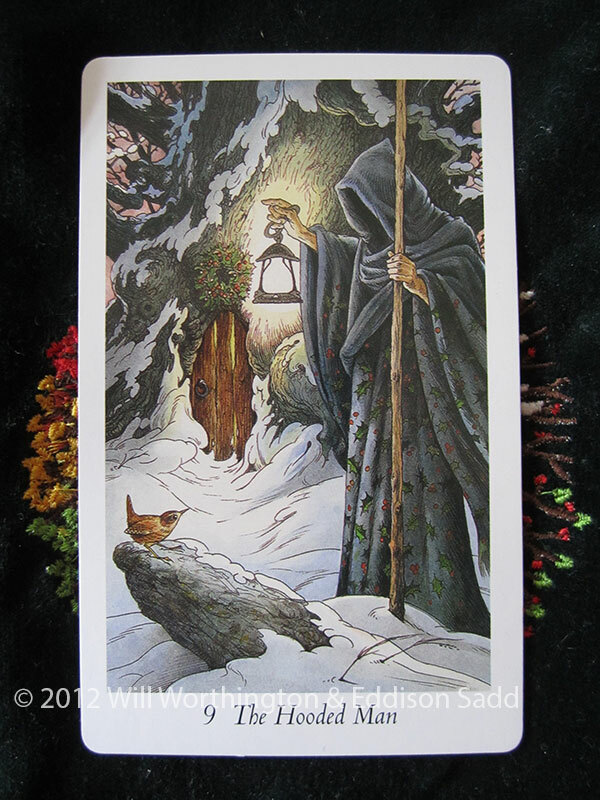 Tarot deck used is The Wildwood by John Matthews, Mark Ryan and illustrated by Will Worthington. Context is the You, Character card from Tierney Saddler’s Deck of 1000 Spreads.